of connected and static routes. 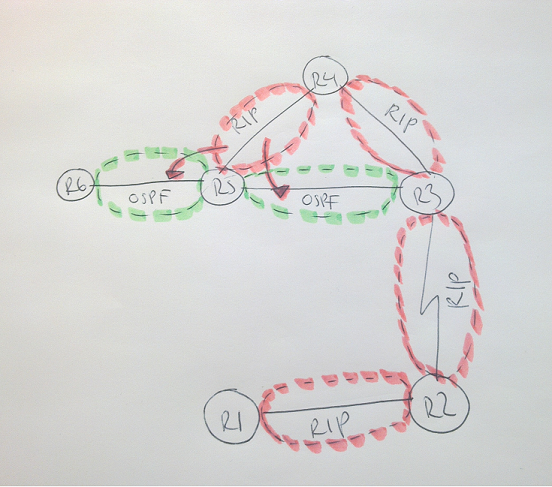 have routing loops in the network. These may not always be visible right away. We can see them when doing a traceroute or when using debug ip routing. can lead to suboptimal routing or routing loops. in loops since it has the highest AD and we can’t define an external AD. different protocols and draw arrows where redistribution occurs. have suboptimal routing. You can download topology and configs here. 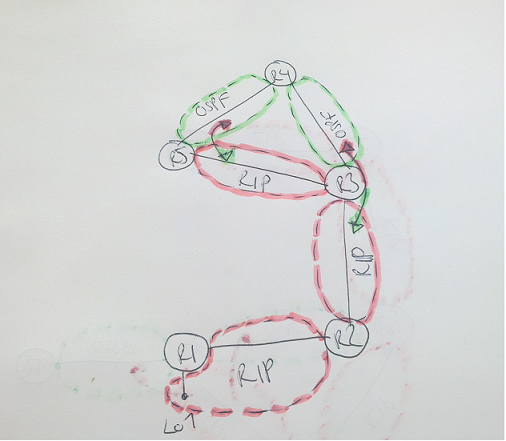 Look at the show ip route and traceroute from R1 to R2’s loopback. a higher AD on it’s external prefixes. So we will have to do this manually. on all routers choosing suboptimal path. we don’t really care, we will match on 0.0.0.0 255.255.255.255.
also be have to be done on all routers with suboptimal path. RIB so RIP routes will be preferred. 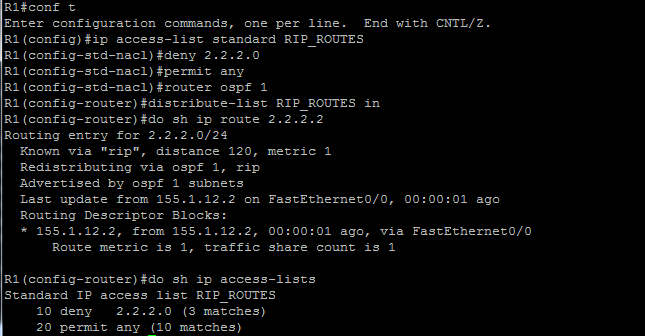 We can also use a distribute-list to control what routes get installed via OSPF. get installed into the RIB. kill any redundancy in the network. So we go to the config mode of the routing protocol we are redistributing into. like this it does not make much sense but it’s very handy in large scenarios. redistributed with an access-list or prefix-list. Lets try that first. permit of the route-map and allows anything else. This is an example of route feedback. has just begun. Debug ip routing will show this procedure repeat over and over. For our final tool we need a more complicated scenario to make full use of it. First lets take a look at the topology. Download configs and topology here. 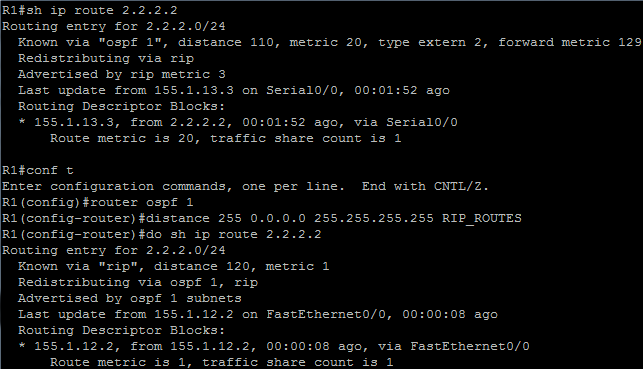 this information via OSPF and then redistributes into RIP with a metric of 1.
a routing loop. There is definately a risk of loops when doing mutual redistribution. When I redistribute something into RIP I usually set a quite high seed metric like 7.
it’s a very large network. that it was a RIP route from R4 to begin with. Now lets try this technique as well. redistributing them back into OSPF. This is what the filtering looks like on R5. Here we deny routes with a tag of 3120 and set our own tag of 5110.
routes via RIP natively to R5. We have a chicken and egg problem here. RIB. We now have a loop. and denies any prefixes that R5 has already redistributed from OSPF to RIP. 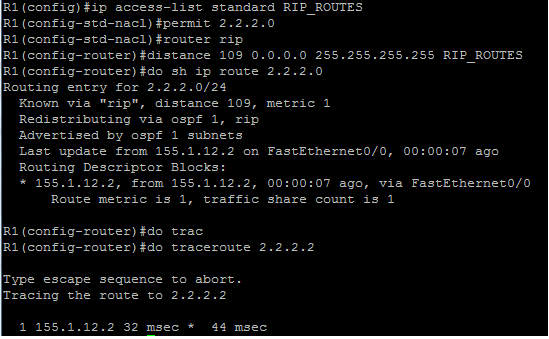 happen we should also tag RIP routes going into OSPF on R5. or other tools to make sure this happens. not finish the lab if you don’t have a stable topology. post in the comments section. This is a follow up post to my last OSPF post about repairing area 0.
initial and final configs here. are coming in as interarea routes. from an interface in area 1. The tunnel is up and we have a new adjacency. router LSA for area 1.
is 0x10 in hex. Maybe it is encoded in hex? So now lets check the routing table. is discontigous. You should be able to spot this by just looking at the diagram. straightforward is to use a virtual-link. However in this scenario it is not allowed. topology and initial configs with OSPF for you which can be downloaded here, final configs are also included. We start by looking at the routing table of R1. received on a non backbone interface. received on a non backbone area. in IGP is critial so if you can’t do something the right way, cheat! some other way. Use static routes if you must! see that we can install all the routes. this on my mock since I had problems configuring the solution below. borrow an IP from another interface. Lets setup the tunnel. in area 0. We must have an IP that is located in area 0 to repair the discontigous network. Now look at the routing table of R1. 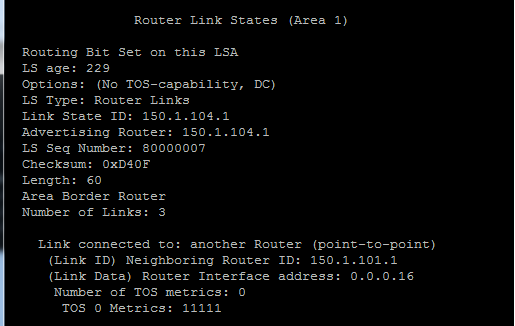 lookups since the routes are pointing at 155.1.34.4.
we see a router LSA for R4 and there is the P2P link. the unnumbered interface’s MIB-II [Ref8] ifIndex value. If we look at the SNMP MIB, must enable SNMP first. the RFC (RFC2328) here. We can enable that behaviour with interface-id snmp-if-index. Now we have the expected value of 10. You can read more at Cisco. packet is 155.1.14.4 which is R4 IP addess and the destination is 155.1.14.1. So I had my first run at a mock lab (Cisco 360). It was not a great score by any means. I got 59% on the TS and 49% on the config. Still, it does show that I’m not THAT far away. The lab was rated as advanced and there were a lot of tricky stuff. Some tasks I solved but not in the way I should have done. I learned a lot of leassons. How to read the tasks and how to solve tasks in TS without breaking requirements. I spent a lot of time on some EIGRP config because I misread the task. The task was to do unequal load balance but I thought I wasn’t allowed to change the delay of the interface which I was. Very good practice indeed. Will try another mock in a couple of weeks. I’m doing my final prep for the CCIE. Vol1 has be finished. Right now I’m focusing on full scale labs and troubleshooting labs. Tonight I have 2 TS labs planned and on friday I’m taking a Cisco360 mock lab. I’ve heard that they are high quality and close to the experience of the real exam. I hope so because they cost a pretty penny. I’ll post my results when done, hopefully they won’t be too terrible but I’m not expecting a really good result either. 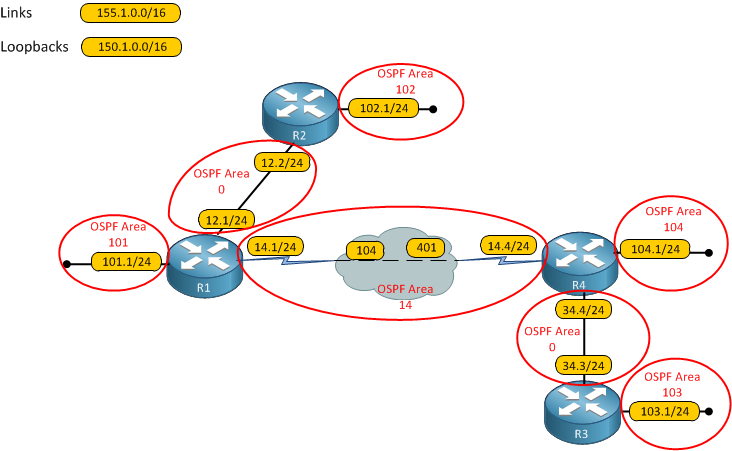 How well do you really know OSPF? OSPF is by far the most complicated IGP on the RS lab if we go in to the details of the protocol and the loop prevention mechanisms. While doing some labs this week I ran in to some interesting issues. 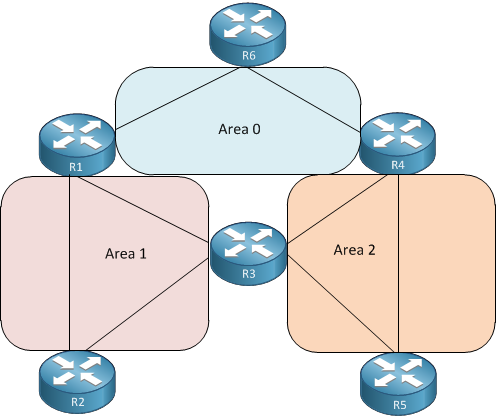 This post will describe different scenarios and test your understanding of OSPF. I will show a diagram and ask a question, try to answer it and when you want to know the answer then the text is hidden below. You can see the text by marking it since it’s written with a white font. Lets begin. We will start with an issue I ran into while doing an ASET lab (Cisco partner labs). Look at the following diagram. R5 is a PE in a MPLS VPN backbone. 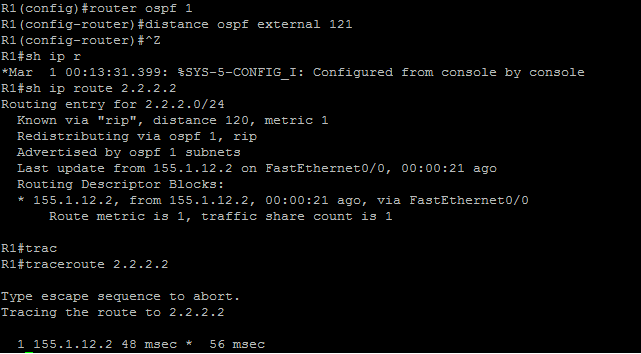 R5 is running OSPF in a VRF towards the CE R4. However R5 will not install interarea routes received from R4, why? Look at the following output. 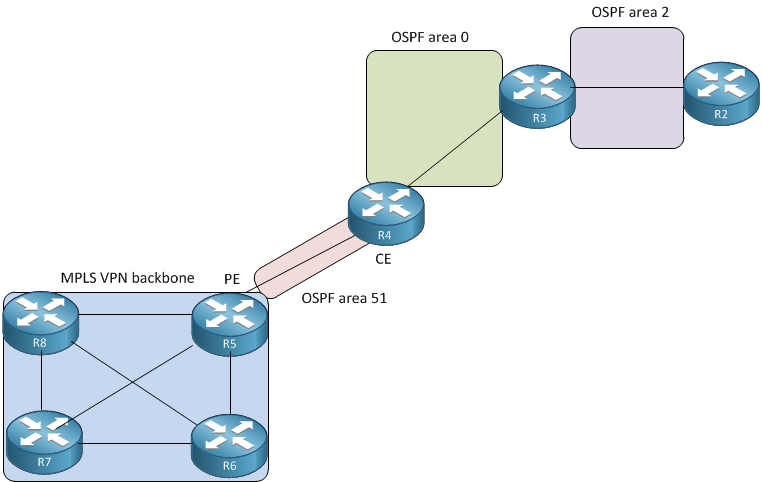 Now lets define some of the concepts of OSPF and test your understanding. Look at the diagram. No, the definition is that an ABR is a router with an UP interface in the backbone area and at least another area. Will R3 generate IA routes for Area 1 and 2? No, it is not an ABR so it will not generate any IA routes. 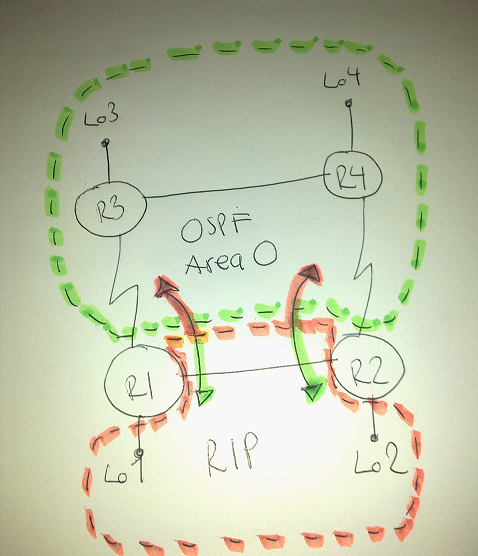 Now we create a loopback on R3 and put it in OSPF area 0. 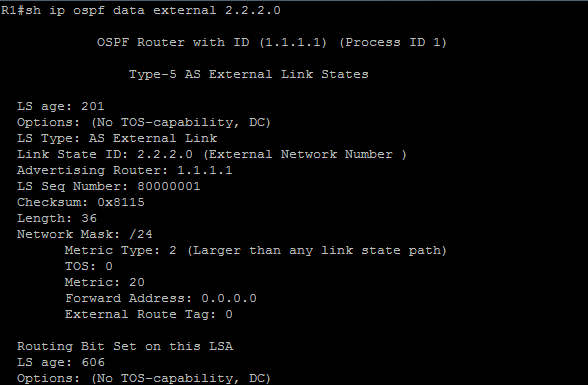 No OSPF adjacencies can of course be built over this interface. Will R3 generate any summary routes now? Yes, even though R3 is not really connected to Area 0 it has an UP interface in area 0 so it will announce itself as an ABR and generate summary routes. If we traceroute the IP of R5 this is the path. Why is this and how can we make the path go directly from R1 to R3 to R5? Look at the OSPF database. R3 is announcing the summary but it is not being used by R1. Why? R1 and R4 have full adjacencies via Area 0 so they will not accept summary routes received on a non backbone interface. To fix this we need a full adjacency between R1 and R3 which is created with a virtual link. R1 is now using the direct path since R3 is now a real ABR. However as R3 now has an adjacency to Area 0 it will no longer accept summary routes from R4. If we want to fix this another virtual link is needed.